Idli burger, a mouth-watering delicacy which no one can resist. It is a fusion burger made from leftover idlis..It is a very simple and easy recipe to prepare and the kids will surely find this attractive. Add coriander leaves, salt, garam masala , bread crumbs and mix well. Make cutlets as big as idlis. Shallow fry them and set aside. Cut the onion and tomato into thin round slices. Take idlis and cut out the bulge from one side to get a flat surface. Fry them lightly to get a nice colour resembling a bun. Now to assemble the burgers spread a little ketchup and mayonnaise on the idlis and place the onion slice followed by the potato cutlet.Place the tomato slice and the second idli on top Put the cherry tomato in a stick and fix the idli burgers with them. Serve with French fries. What a fusion recipe Shobha, burger and idlis. Crunchy throughout I guess as you've fried the idlis. Awesome recipe. Yes Mayuri I have fried the idlis to give a brownish look. Thanks for liking. 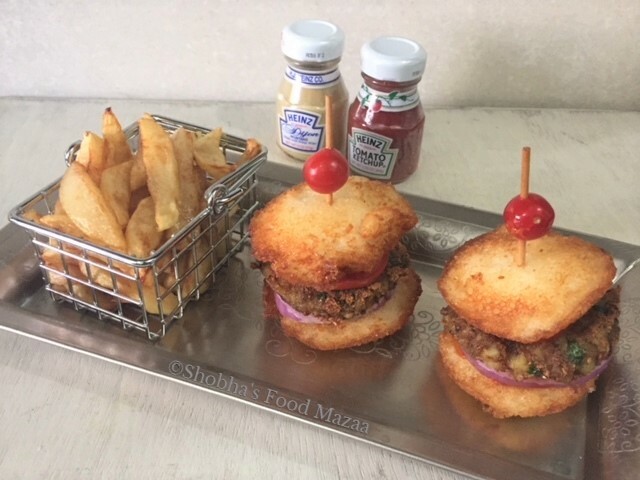 Wow these idli burgers looks so cute and what an innovative idea to use idlis instead of burger buns , have tried fried idlis but this recipe looks so tempting , awsome recipe. Thanks Soma.. do make it sometime and share the feedback. Wow.. Idli in burger.. Such a desi twist in the Burgers. Kids will defnitely fall for this yummy goodness.. Yes Sharmila.. kids always want nice and innovative food. What an interesting burger that is. Never thought idli can work as a substitute for buns -- very clever idea indeed. Thanks for the compliment Pavani. Yes Drashti.. we have to keep trying out new variations to attract the kids. They get bored of the same food. What a fantastic desi burger, one of the burger i have seen yet, an excellent avatar to those left over idlies. Awesome job Shobha. Awesome now my kids will not refuse idlis. Thanks to you I have a great new fusion dish to work on. Thanks Archana.. I am sure they will like these idli burgers. This is an apt post for anyone who is trying to avoid bread and wants something different. Kudos to the thought of using idlis as bread. Loved the recipe and the way you have used the key ingredient into something different and exciting for kids and adults both. Fusion and how! Super! Glad you loved the idea of these burgers. Please do try and let me have the feed back on them. Oh wow.. What an innovation. Loved the idea of using Idli as burger buns, Brilliant ! What s lovely way to use up left over idli and give it a new avatar. The burgers looks scrumptious. Thank you Nayna.. glad you liked them. Now I know what do with leftover idli. Crunchy and delicious snack which is hard to resist. What a creative idea. Only Indian can do this :) I will try your recipe when I make idli. Looks delicious. Thanks Uma .. we Indians are so fond of cooking and eating which makes us really think of new ideas. Such an interesting idea of making gluten free burger base. I am bookmarking this recipe to try soon. That'a a perfect fusion snack for kids Shobha. Loved it and need to try. Yes Jayashree.. kids will find it different and love to eat. Shobha - these idlis look so tempting. I like the idea of using idlee instead of bread. I love the cute little Heinz bottles. Thanks for liking the idli burgets Mina.. These bottles are from a hotel we stayed in USA.. So cute na. Idli burger are again in my list from a long time. They so so tasteful and a new way of serving idlis too. Loved your version of making it. very yummmy. Thanks for liking the idea.. do share the feed back when you make..
Yup.. a treat for kids as well as adults. Wow! This seems really great. I love to try out your fusion food tonight.